Want to improve your chances of getting a medal at your next GKR tournament? Here are some tips for tournaments that are sure to help your performance. Looking neat and tidy will give the judges a good impression, and it will also help your confidence. Be sure to have mum or dad give you a clean, ironed gi. If you have long hair, have it tied back neatly and try to keep your fringe out of your eyes. Finally, tie your belt nicely so that both ends hanging down are the same length. As kids, mum and dad are always telling us to keep our voices down. The good news is that in the tournament ring, these rules don’t apply. In fact, in a tournament, louder is better! When you hear the judge call out your name to come up and perform, respond very loudly with “Hai” as you get up. When you enter the ring and call out the name of your kata, call it out very loud and clear. This tells the judge that you are confident. And when it’s time to kiai in your kata, do it so loud that everyone at the tournament hears you. One thing the judges are looking at is your focus. The better your focus the better the score they will give you. You can show them that you have good focus by putting on your ‘kata face’. This is one of serious concentration, and NEVER looking around. And when you finish your kata, stand still (without fidgeting) while waiting for your score. Sometimes we do all our punches and kicks as fast as we can but we forget about our stances. When the judges are deciding what score to give you, they pay close attention to your stances. Make the decision that before you go up, you will try your hardest to do the longest, lowest and neatest stances you can do. Manners and respect are important parts of karate. 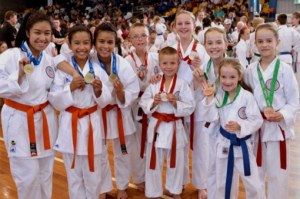 So when you are at a tournament, KIDS TIPS 4 TOURNAMENTS after each person has completed their kata, be sure to join in and clap and cheer for them. Even if you don’t know them, it shows everyone that you are a good sport. Plus I’m sure they tried his or her hardest and for that, they deserve your applause. Finally, if you get a medal, that is awesome. But if you don’t get a medal, don’t worry, because as long as you tried your best then you should be proud of yourself and happy. Kumite requires lots of energy so be sure to get a good night’s sleep and have a good breakfast. Even if you are a little nervous and don’t feel hungry, eat a bowl of cereal anyway. Also pack a bottle of water or Gatorade to bring with you to sip between rounds. It’s not how many punches you throw that scores you points, it the quality of your punches. If you want to score points, make sure that after every punch you pull your hand back to your hips. Every time you punch, you need to yell out a nice, loud kiai. This tells the judge that you were trying your best to punch hard and fast. If you forget to kiai, your point won’t be scored. The most common reason that kids don’t score is because they are too far away from each other. The trick is to take a big step forward with your front foot each time you punch. This will get you close enough to score… but remember it’s non-contact! Another trick is to step forward after each kick. When competing, you have two goals. To try and score points for yourself AND to stop your opponent from scoring points. This is where your guard comes in. You need to keep your guard up high and out from your body. And when your opponent throws a punch, move your guard to block as fast as you can. Whether you win or lose is not as important as to whether or not you tried your hardest and had a great time. So decide before you start that you are competing for fun. Winning is just a bonus.